Whether your children are newborns, preschoolers or in school, it is time to start thinking about college. From personal experience, I know that the sooner you start saving for college, the easier it is to carve out of your budget. Based on advice from the experts, here is what you need to know about saving for college. One of the first components of your college savings plan is to define your goal. Not all college educations are the same, and you will want to consider early how you will define success. These costs can vary greatly depending on the type of college or university your child will attend, so making a decision about their educational destination is important. Your local community college will have lower costs all around than an Ivy League institution or a private or public university away from home. Of course, these costs do not include room, board, and other similar costs. In most cases, many of these factors come into play. But early on, parents should have a strategy for paying for college. Clearly, if at all possible, student loans should be avoided. These loans saddle your children with college loan payments long into their careers. And some careers make paying back student loans harder than other careers. Experts recommend that parents first look at what percentages of costs might be borne through each of these resources. For example, you may want your student’s savings from their pre-college years to pay 5% of the cost. Perhaps you will want your student to be employed part-time during their college years, paying perhaps another 5% of the cost. Each family’s views on these sources will be individualized, so consider it carefully. 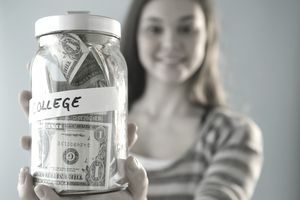 Once you have estimated the annual amount in today’s dollars that you will need for your student’s education, visit the College Board’s College Savings Calculator to see how much you will need to save each month to be ready when your child hits his or her freshman year in college. Income grows tax deferred. You will not pay federal or state taxes on the amount you set aside each month in these plans. Distributions are not taxed federally. When you draw funds out of these plans, the money you draw out is not subject to federal income tax. The owner of the account stays in control. Your student cannot just draw out funds for some other purpose; the parent (or grandparent or another person who owns the account) makes the decisions about how and when it is used. Plan assets are professionally managed. Rather than putting your college funds into a certificate of deposit or the stock market, the 529 plan is managed by professional investment managers. Savings is comparatively painless. Once you enroll and authorize automatic deductions, the deposits come out automatically in the way your specify. You can kick back, relax and watch the fund build. Each state’s 529 plan is a little different. Find information about your state’s 529 plan at the Saving For College site. ESA plans are good but are not enough all by themselves for most college savings plans. The Roth IRA is mainly a retirement savings account, but proceeds can be used for educational expenses for the IRA owner, spouse or children. Contributions to the Roth IRA, like the ESA, are not tax deductible, but all interest earned is tax-free. You can contribute up to $4,000 per year into a Roth IRA. Again, you will want to use Roth in conjunction with other plans. Many parents set up a regular savings account at their bank or credit union for college savings. This is a very flexible approach as there are no limits on how the funds are used. But with that flexibility comes the lack of any tax advantages. BabyMint. When you join BabyMint, you receive rebates from BabyMint affiliated retailers and rebates on the use of their MBNA BabyMint credit card. UPromise Like BabyMint, when you sign up for UPromise and use your credit card at selected retailers, rebates can be applied to a 529 college savings plan. The most important part of saving for college is setting your goal and planning to achieve it. By taking a realistic look at your college expense needs and identifying a balance between funding and savings resources, you can be prepared for the time when your child enters college and begins his or her preparations for a rewarding education and career.